Silver Springs Shores — Marion County sheriff’s deputies arrested two people on Monday who were involved a shooting at a fireworks stand in the 7100 block of Maricamp Road. 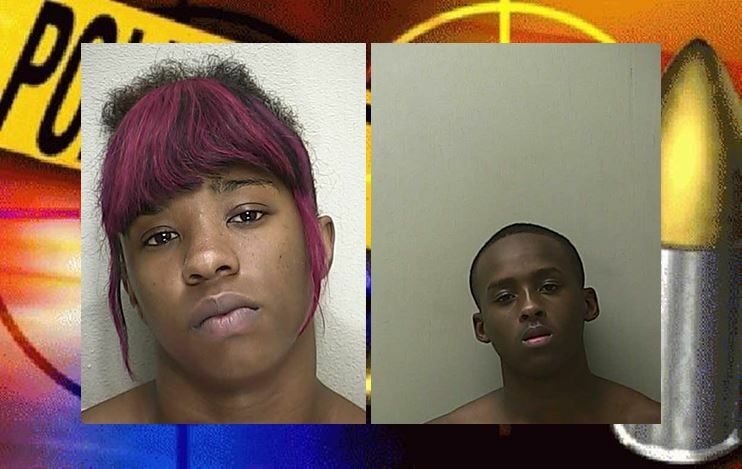 Quinnesha Roberts, 20, and Anquan Rashard Everett, 14, attempted to rob the fireworks stand and shot the security guard in the process. The shooting took place at approximately 12:30 a.m. According to reports, the two criminals entered the fireworks tent wearing black clothing, masks, and gloves. Once inside the tent, Everett demanded to see the safe and then shot the security guard in the shoulder. Both of the suspects then fled the tent, but returned moments later and shot the guard again — this time in the left leg. After a brief struggle, the suspects fled the scene. During the investigation, a deputy saw two people running from the area and followed them to 16 Pine Trace Drive, where the suspects were entering the house. Roberts’ family was awakened by all the commotion and exited the residence. They identified Roberts as a family member and advised that Everett was also inside the home. According to reports, while deputies were at the residence, a K-9 unit was used to track where Roberts and Everett were last seen running. The K-9 located a pair of shoes which matched imprints found at the crime scene. The K-9 also led the K-9 deputy to a dumpster, where he located a .380 handgun, a black glove, white shirt, a black mask, and a green pair of overalls. Everett had fled to the residence wearing only his boxer shorts. Investigators said that the handgun was stolen from Roberts’ grandmother. Everett’s mother, who is also a felon, told her son not to cooperate with investigators. Roberts also refused to cooperate with the investigation. Both suspects were arrested and charged with one count each of Attempted Felony Murder and Robbery with a Firearm. They are being held without bond. Their next court date is scheduled for August 9, 2016. Everett was also arrested in April for Felony Possession of a Firearm. Major crimes detectives said that Everett and Roberts “cased out” the fireworks tent the day before the shooting. The security guard is expected to make a full recovery.